Metertech Inc. in Taiwan has been manufacturing analytical instruments since 1981. Due to their characteristic features – robustness and functionality -, these instruments can be primarily used in industrial, water analysis and educational laboratories. Three types of photometers belong to this product family: the smallest is the SP-830 + capable of measuring within the visible wavelength range and with its buttons provides space-saving and quick measurements at the user set wavelength without a computer. The SP-880 is an instrument that also measures in the visible wavelength range, but the use of a computer software can be found among its control options. On the display of the SP-8001 measuring in the UV and visible wavelength ranges, also the recorded spectra can be seen, and the control of the instrument is possible either with buttons or a software. This is a single beam instrument capable of measuring in the visible wavelength range and allows quick absorbance and transmittance readout and after providing the proper factor concentration measurements can be carried out. The samples can be placed into the cuvette holder either in square cuvettes of max. 50 mm length or in circular ones with a diameter of 10-13 mm. The control is provided by six buttons which allow the quick and easy set up of the wavelength necessary for measuring the particular sample. The measured values can be read on the 2-line LCD screen in absorbance, transmittance or concentration values and it is possible to print them with the printer connected directly to the instrument. This is a single beam spectrophotometer capable of measuring in the visible spectral range. Controlled by its built-in buttons, it can be used for determining absorbance, transmittance and concentration at the wavelength set up by the user. In the cuvette holder square cuvettes of 10 – 50 mm, or circular ones either with a diameter of 10 – 13 mm or optionally of 16 mm can be placed. The measured values can be read on the 2-line LCD display in absorbance, transmittance or concentration values. In the internal memory of the SP-880 can be stored 100 measurement results. With the printer connected directly to the instrument the results can be printed out. With the PC-Mate software the SP-880 can be used also for recording the spectrum. This split-beam spectrophotometer is capable of measuring both in the UV and visible spectral ranges. Due to its large LCD display, with its built-in buttons it can be controlled at full extent and it has all the potential evaluation possibilities that the UV-Mate software provides in case of computer control. To the measuring position a standard 1 x 1 cm cuvette can be placed. However, with the use of optional cuvette holders it is possible to place cuvettes of a length up to 10 mm into the instrument, to use a six position cell changer and also to thermostate the cuvettes. In case of a large number of samples the use of a sipper is also possible. 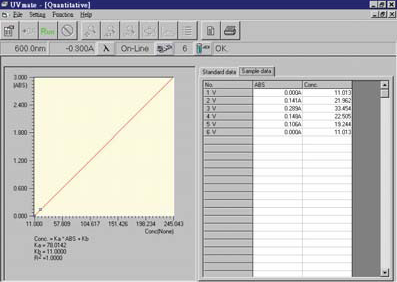 Internal software features: easy reading and measuring of the absorbance or transmittance values, spectral recording, storing and processing, time scan, quantitative analysis with a calibration curve, simple kinetics, determination of DNA/RNA and protein concentration. The PC-Mate and UV-Mate softwares provide support for the control, the documentation and archiving of the measurement results of SP-880 and SP-8001 spectrophotometers. The PC-Mate can be used with the SP-880 spectrophotometer used for measuring only in the visible range, and since this instrument does not have an own high-resolution display, the software extends its usability significantly. In this way the spectrophotometer can be utilized not only for reading absorbance, transmittance and concentration but it is also suitable for multi-wavelength photometric measurements, spectrum recording, time scan and kinetic measurements, quantification and protein analysis. The SP-8001 spectrophotometer measuring in the UV-visible wavelength range is controlled by the UV Mate software, which in addition to the measurement methods listed above can be used for determining DNA/RNA in accordance with the 260/280, 230/260, Warburg-Christian methods and the ones defined by the user.